Entry filed under: Behavioral Finance, Profiles. 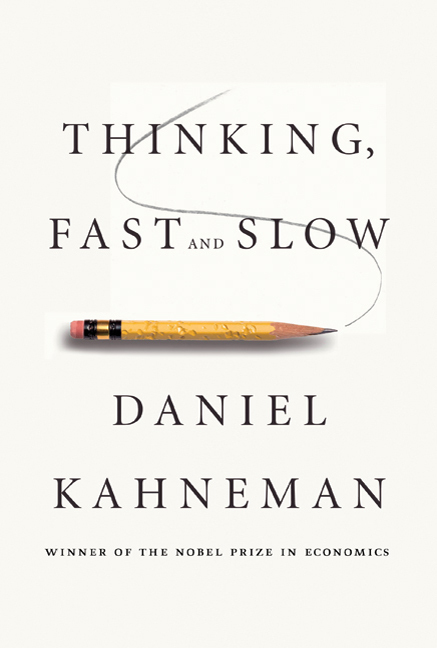 Tags: anchoring, Daniel Kahneman, decision making, intuition, Nobel Prize, Odean, overconfidence, Rabin, Richard Thaler, risk aversion, System 1, System 2, Thinking Fast and Slow. If the ball is $0.10 and the bat is $1 more, then that would mean the bat costs $1.10, making the total $1.20…WRONG! This is clearly a System 2 problem, which requires the brain to see a $0.05 ball plus $1.05 bat equals $1.10…CORRECT! This is confusing me,why did 0.10 plus 1 mean the bat cost 1.10 and making the total 1.20. ? In this problem, the total MUST be $1.10 AND the bat MUST be $1 more than the ball. Those were the parameters given in the problem. If the bat was $1.10 and ball $.10, then the $1.10 combined cost requirement would not be met (combined cost of $$1.20). Hopefully that makes sense.